Arjun Chatterjee is an award winning filmmaker who, after completing his Masters Degree in film and animation from the prestigious NYU Tisch School of the Arts, went on to direct in Singapore for over four years with Big 3 Productions. Arjun is now the Company Director for Big 3 Media-India operating primarily out of Mumbai but working on shoots around the globe. He has vast experience with TVC's, Digital Commercials, Short Films, and Corporate Videos. Both animated and live action. 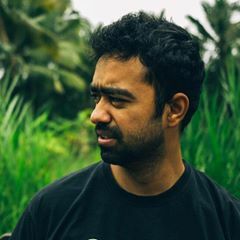 He was most recently commissioned by HOOQ, a joint venture of Warner Bros., Sony Pictures, and Singtel to create a series, after his pilot 'Bhak' won the prestigious HOOQ FILMMAKERS GUILD. The pilot episode of the show is currently live on HOOQ. Arjun has also directed 3 films of his own and is currently writing the fourth. The films have been featured in several festivals including the Mumbai Shorts International Film Festival, Sacramento International FIlm Festival, Cartoons Underground Singapore, Kolkata Shorts Interntional Film Festival, The Indian Cine Film Festival and more snagging awards for Best Director, Best Film, Best Cinematography, and Best Editing. His film 'Julie' was accepted into the London Independent Film Awards, The Accolade Global Film Competition, and PUFF Hong Kong. It won Honorable Jury Mention for Best Film at the Mumbai Shorts International Film Festival. Arjun is a passionate and determined filmmaker and storyteller putting all the effort he can into every project he can get his hands on. He has directed commercials in Singapore, India, Europe, Japan, Australia, Hong Kong, Indonesia.